RIGGED AND READY FOR ACTION! Featuring the 2.0 head with prism eyes, scale pattern molding and a brass willow blade. Measures less than 3.75 inches long. It is the ultimate finesse presentation that\’s perfect for Bass, Spots, Walleye and Crappie! With an 1/8th ounce on the bottom and a 1/16th ounce on top, the Buffet Rig runs true and straight! 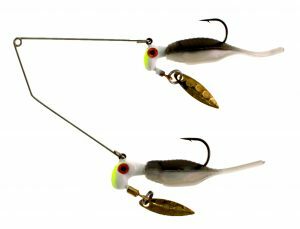 View cart “RBB15-141 Reality Shad Buffet Rig Sushi” has been added to your cart.